The Montana Grizzlies left everything on the court against the No. 22 ranked Oregon Ducks, building a seven-point lead in the first half and keeping the game within grasp until the closing minutes. 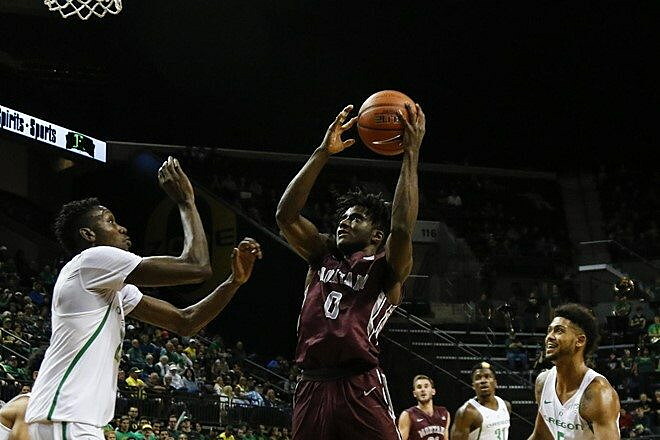 But the athleticism of the Ducks paired with a dominant inside performance from Chris Boucher proved too much as UO would go on to defend Matthew Knight Arena for the 32nd-straight time, defeating the Griz 81-67 on Tuesday night in Eugene. The loss puts the Griz at 3-8 on the nonconference season but more than proves to the young team they are capable of competing with the nation’s best. The win puts the Ducks at 9-2 and gives them their seventh-straight victory. The Ducks, who suit up the nation’s best shot blockers, outrebounded the Griz 40-34, but Montana held its own, pulling down 16 offensive boards to Oregon’s 14. What Montana lacked was a double-figures rebounder, able to pull down boards against the length of the Ducks. Boucher made the Griz pay for it too, putting in a masterful display down low to lead UO with 23 points, 19 rebounds, and five blocked shots. Ahmaad Rorie made the most of his return to Eugene, leading Montana with 19 points of 9-of-20 from the floor. Rorie went on a tear in the second half, carrying the Griz through dry spells with 11 of his 19 points coming after the break. Michael Oguine also scored in double figures with 12 but was forced to miss minutes toward the end of the game due to foul trouble. Walter Wright also finished with 12 points but picked up four fouls, and Jack Lopez fouled out. “It’s hard to win a game when you’ve got two, three guys with four fouls halfway through the second half. That became an issue for us. Most of that came from trying to block off; those guys were just too athletic for us around the rim,” added DeCuire. The Duck’s length was on display in the opening minutes of the game as Oregon raced out to a 10-2 lead with the help of Boucher, who had 12 points, eight rebounds, and four blocks in the first half alone. The Grizzlies bounced back, though, when the shortest player on the court, Wright, attacked the tall Oregon timbers in the post for a lay-in then followed it up with a three to spark a 10-0 run for the Griz, giving the visitors their first lead of the night. Montana kept the pressure on with Oguine finding success in the paint, scoring seven points in the first half, while forcing a rash of turnovers by the Ducks on the defensive end. At one point Oregon had given up eight turnovers to only three for the Griz, and Montana scored points in transition in the first half. The Grizzlies’ high-paced attack resulted in a seven-point lead for Montana with eight minutes to play until halftime, but the Ducks would climb back to take a four-point lead at the break. Rorie came out of the locker room determined to take down his former teammates, scoring nine points on 4-of-8 from the field and handing out two assists to keep the Griz within striking distance in the first 10 minutes of the period. Defensively, Rorie was playing on another level as well, holding one of Oregon’s highest scorers, Tyler Dorsey, to just six points. With 11 minutes to play in the second half, Oguine closed the Oregon lead down to just for points, scoring five-straight off a layup and three free throws on top of a three-pointer from Wright to cut the lead to 59-55. The Ducks would then go on a 10-3 run over the next seven minutes of play to build a 61-74 lead which the Griz couldn’t recover from as the home team finished with a flurry to take the 81-67 win. “We’ve got some guys hanging their head a little bit. They’d like to win one of these games. They keep getting close and not getting it, so they’re a little upset about it. I told them if you continue to play with this type of energy and this type of chemistry, we’ll be fine, and you’ll look back a couple of months from now and be happy with where we’re at,” added DeCuire. Montana returns to the road for one more nonconference trip on Saturday, Dec. 17, against UC Riverside in California. The Griz then cap off the nonconference schedule at home against the Pepperdine Waves before hosting Idaho State and Weber State to knock the lid off the Big Sky Conference schedule on Dec. 29 and 31. Montana has proven it can handle big games against top teams, for DeCuire, it’s about sustaining that play through the league season.